Lots of kids on the mat doing Judo. Three black belts teaching the kids with the young ones taking the lead. A couple of grey haired 4th / 5th Dan Black Belts waiting for the Senior Class but who have come along early because its great to see kids doing Judo. Well term Term Two has started with bang. 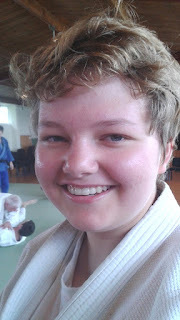 We have heaps of kids on the mat at Pukekohe with new kids coming through in the beginners class and we are even getting regular numbers with our Friday night adult's class! Big ups to Kyle and the boys from Pukekohe - Well done. Also to Tony for making the trip to Pukekohe to support the new class. 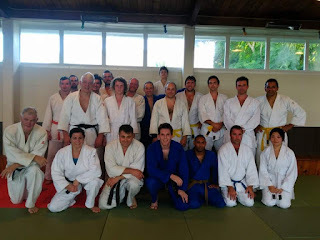 We had 21 adults on the mat on Saturday and were missing lots of regulars. The social atmosphere and emphasis of safe training appears to be working. We haven't had any serious injuries yet (touch wood) and the team are having a great time. Our fantastic German instructor Pia has gone back to Germany and we are all very sad to see her go. Pia was a very good addition to our pool of instructors and good fun. She was part of the team a became a friend for many of us and we will all miss her. For any of you out there thinking of coming to NZ and doing Judo we are always keen to host a guest so please don't be shy in contacting us!